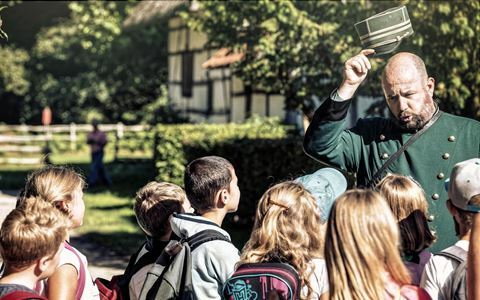 ‘Experience@Bokrijk’ is our umbrella term describing a day out for your class, where your pupils will discover, in an interactive way and based on their own experiences, how life used to be. The level of the themed route is adapted to meet the group’s needs. Supervision for the programmes in Haspengouw is provided by our experienced guides, a real falconer and Bokrijk actors. In the interactive Bruegel Game the jester from the painting 'The battle between Carnival and Lent' leads you and your family on a digital rope. Bruegel meets Pokémon Go and Snapchat in Bokrijk! Upon departure*, in the residential house from Wortel via “augmented reality” you will be given a virtual head to wear, after the example of a real model from the 16 century. The game includes an exciting search for missing objects from the painting, which you can find around the locations of the six experiential stops. Collect them all and put them in a proud position on your hat! Along the way, you have the chance to improve your score by achieving the goals of various games. On this fun and involving route, children compare opinions about old-fashioned games and life in the good old days with how things are today. The guide takes them to the "game areas" where the boys and girls of yesteryear played: the village square for fun fair games, a wash tub for blowing bubbles or a field for throwing at a harrow. What games are still popular? The class plays games with or against each other with loads of games such as jacks, sack racing, hoop and stick, blind man's buff, hopscotch, playing with marbles and rock-paper-scissors. Do they miss their smartphones on the route? Of course not! During this route the group discovers how traditional CRAFTSMANSHIP provided basic needs - from housing, food and clothing to heat. We start with a profile test to find out what individual talents the group has. Who has a natural ability with a wood saw, who can bundle twigs together, chop wood or recognise herbs? Find out whether your group could cope with working in a nineteenth century village. Which jobs have disappeared and which are back in fashion? How do you learn a craft? The guide helps the group to compare the old ways with their own life. It is an ode to manual labour and craftsmanship of the past, today and tomorrow. In the Bokrijk Rally, participants discover the daily life of long ago via playful competition. Two teams take each other on in searches and hands-on tests; horseshoe throwing, rope jumping, relay races, and so on, where the key ingredient is team spirit. All the tasks are directly linked to rural life 100 or more years ago. What if... you could only have a wash once a week? What if there was no supermarket? What if you had to walk for hours to get to school? And what if there were no computers? Through conversations with the guide and creative hands-on tasks, your class will compare contemporary and bygone daily life. The guide always uses the children’s answers to introduce the next topic, because their opinions are important! Tag along in a quest full of exciting challenges and follow the steps of well-known fairy tale figures, witches and goblins. In this magical adventure you will decide how the story goes. Once upon a time… have fun!